The actual recording equipment you can't see is on the floor. A Penncrest Caravelle 10 by Smith Corona came in for repairs. This beautiful Underwood Portable also came in for cleaning and repairs. The lighting is bad but this Rocket is awesome. My typecasting machine this week is also a customer repair. I liked this decal. It adds character to this No.5. Great to hear business is going well! I think it is very cool you get to sell machines to award winning authors and TV shows like the Fringe. What a privilege! Thanks for the latest installment of good and interesting news. That Penncrest is surprisingly handsome. I have a Corona 3 (my first typewriter bought after I knew that I was a collector) with that same International Typewriter Exchange decal. Did you know that they are still in business?? Their website is here. What wonderfully brilliantly-colored decals on that Underwood! Very cool. Mark- Thanks for your comments. The fun part of having a retail business is you never know who will walk through your door each day or what fantastic machine you get to work on. Richard- Believe it or not,I do business with ITE. I never made the connection. I buy reconditioned Wheelwriters from them when I'm in a pinch and some spare parts. The Penncrest is a looker for sure. Types nice too. I actually started my typecast on it Friday night but couldn't finish it and the customer was picking it up on Saturday so I switched machines and retyped it Saturday night. Cameron- Thank you! That is a wicked cool decal. It's a fun machine to type on too. Tom, great updates! 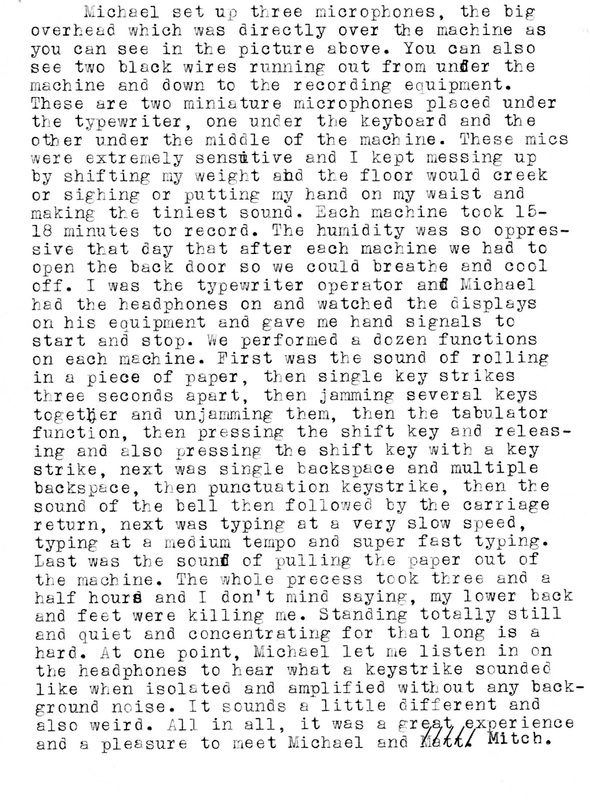 Yeah, sound recording is long and tedious, but there's definitely a market for typewriter sounds for film projects. 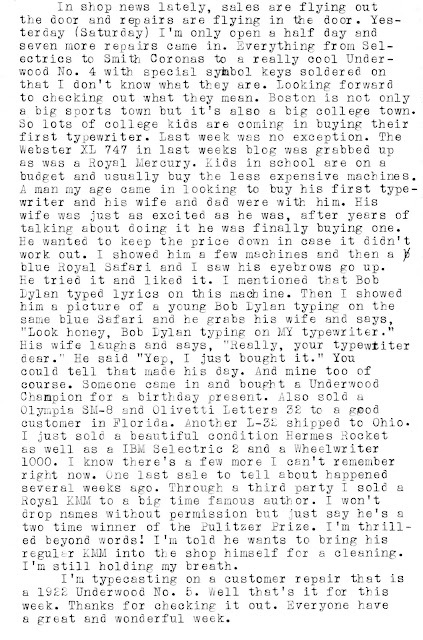 For my own non-commercial short film, I had to purchase typewriter sounds from itunes. The Penncrest really looks like a child of the 60's-70's. Tom, great post. I am glad to see that you are still busy. 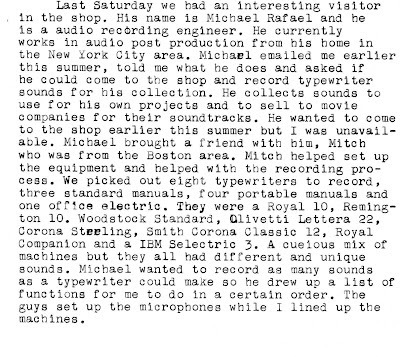 That story about the guy buying the Safari was really nice. 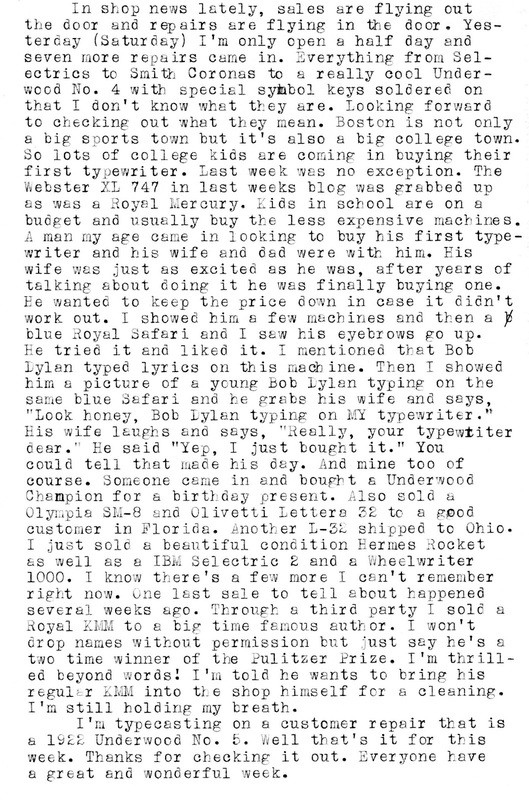 It is heartwarming to hear that people still want to buy typewriters. So much so, that they are excited to go to the shop and pick one out. I am also interested in the mystery big-time author. I think I might know who it is, but I'll keep my speculation to myself. Glad to see business is booming. 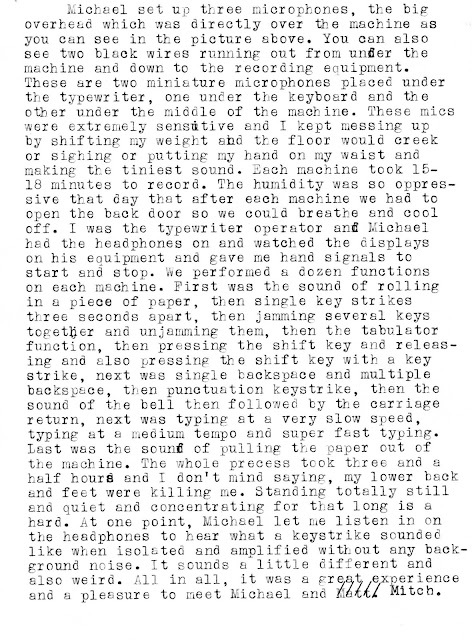 That's great that you are now the sound behind typewriter sounds we may be hearing later on. Did he do any on different surfaces like a metal desk, wood, a pad, carpet, etc.? That Underwood is fantastic. I love the decal. The recording session sounds interesting, to say the least. 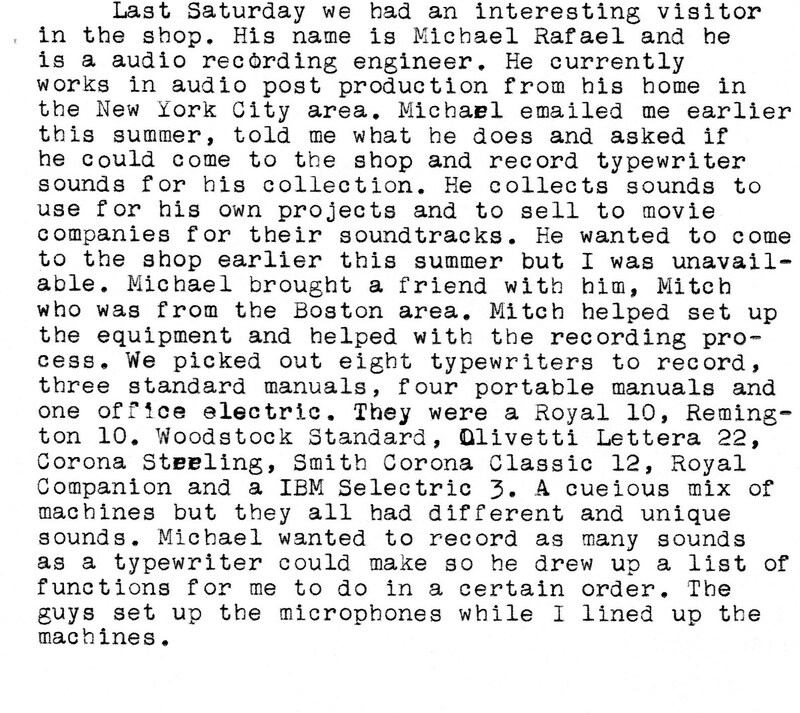 I saw a video of Michael Winslow doing all sorts of different typewriter sounds for different makes and models. Pretty damn impressive. How interesting! I would love to hear those sound samples. I just recently picked up an Underwood Portable, identical to the one in the picture above. I found it in a little thrift store in Minnesota and talked the owner down from $45 to $25. It still works and came with the hard case - did I make a good buy? I'm not looking to sell - I'm just curious.